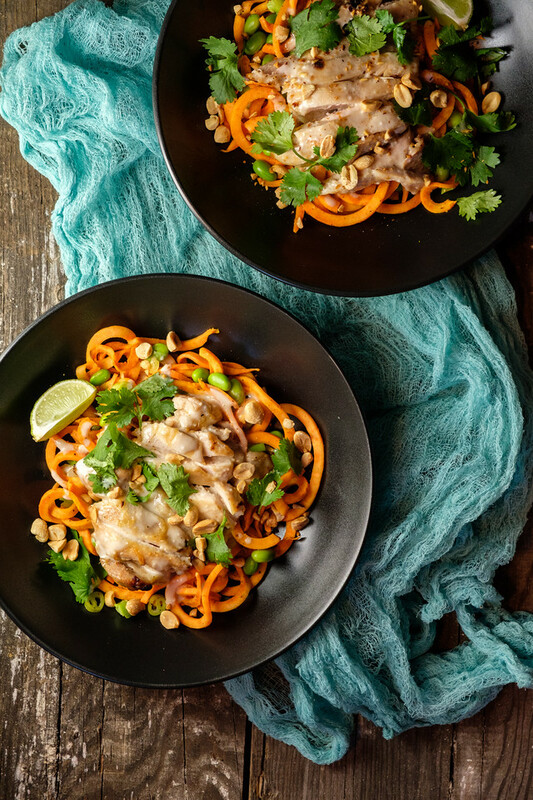 This Miso Chicken with Sweet Potato Noodles proves once again that healthy can be so delicious!! Spiralized Sweet Potatoes are so easy and make a healthy replacement for pasta! 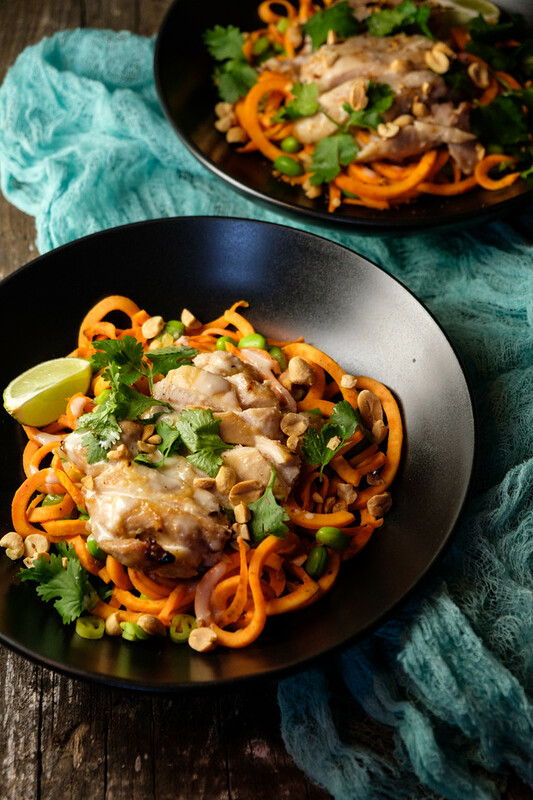 Click here to pin this Miso Chicken with Spiralized Sweet Potato Noodles now! Do you have a spiralizer? I have to admit, I was late to the party. I made this Vietnamese Zoodle Salad and it was so good I decided to try spiralized sweet potatoes. Sweet potato noodles. Swoodles? Spoodles? Whatever you call them, they were wonderful!! This whole Miso Chicken with Sweet Potato Noodles was so wonderful that after having leftovers for dinner last night, Mr. Sidewalk Shoes insisted that I put this in regular rotation. If you’re looking for more spiralized recipes, these two books are my favorites: Inspiralized: Turn Vegetables into Healthy, Creative, Satisfying Meals and Inspiralized and Beyond: Spiralize, Chop, Rice, and Mash Your Vegetables into Creative, Craveable Meals. Then the sweet potato noodles are tossed with some olive oil and roasted for only 4-5 minutes. They come out softened, but still with a bit of bite to them. Like al dente pasta. They were amazing! The sweet potato noodles will definitely be my take away from this recipe. Though, if Mr. Sidewalk Shoes has his way, we will definitely be having this Miso Chicken with Sweet Potato Noodles again! I found this recipe in a Donna Hay Fresh & Light Magazine. 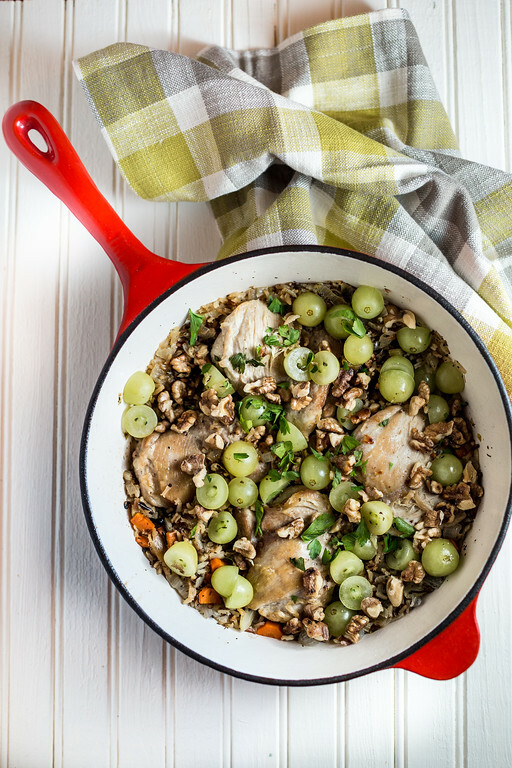 This one pan Braised Chicken Thighs with Grapes and Wild Rice is loved by kids and adults! 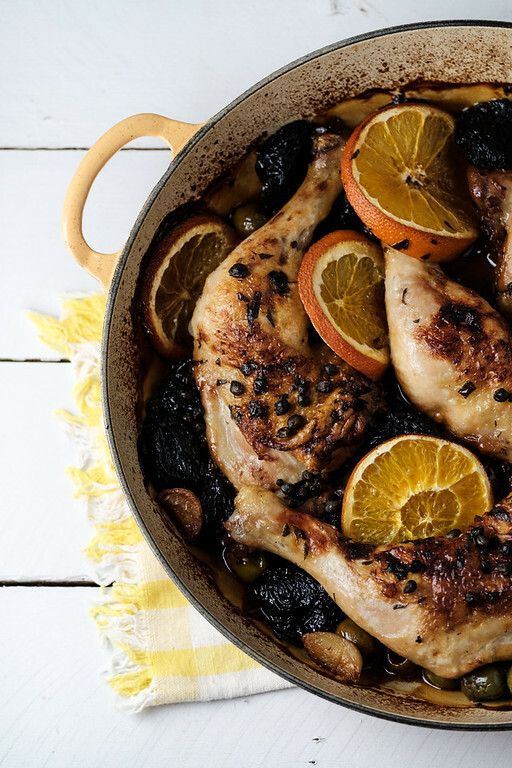 This rustic Braised Chicken with Olives, Capers and Prunes is a riff on a classic, you’ll make it over and over again! 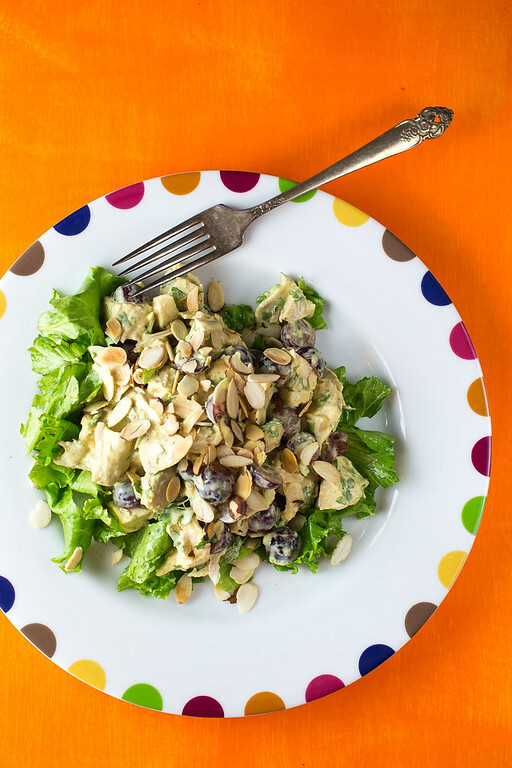 This Curried Chicken Salad makes a great lunch or a light dinner! Miso marinated chicken rests upon sweet potato noodles and edamame with a miso coconut dressing! Preheat broiler to high. Combine the miso, honey, garlic and half the oil in a large bowl. Add the chicken and toss to coat. Let marinate for 20 minutes. Line an oven tray with foil. Place the chicken on it and broil for 4-5 minutes per side or until cooked through. Set aside. Turn oven to 350. Divide the sweet potatoes between two trays and toss with the remaining olive oil. Roast for 4-5 minutes or until just softened. Place the sweet potatoes, onions and edamame in a large bowl and toss to combine. Slice the chicken. Divide the sweet potato mixture between 4 plates and top with the basil, cilantro, cashews, and miso dressing. Serve with lime wedges. I love miso and it sounds like the perfect thing to go with this chicken! This is a really beautiful and flavourful dish. Love the coconut miso dressing! I love the dressing too! What a unique dish! That coconut miso dressing sounds amazing – definitely going to try this! Oh darn! Thank you, I will add it, it was 2 tablespoons of extra virgin olive oil! I just pinned this amazing creation. I must have some of the sweet potato noodles! I really appreciate you sharing your awesome post and your talent with us at Full Plate Thursday. Have a great weekend and come back soon! What a gorgeous looking dish. Definitely one I’d like to try. I am very late to the party too, I should get one. This looks good. Yes, I plan on using mine a lot more! Oh my, this looks and sounds divine. I’m going to try this dish. It is sooo good! Let me know what you think!